KPK Revenue Authority KPRA BPS 12 BPS 16 Jobs Via NTS has been announce. Last date to apply is Monday, 17 December, 2018. Khyber Pakhtunkhwa Revenue Authority KPRA as corporate entity, was established under the Khyber Pakhtunkhwa Finance Act, 2013, with the mandate to administer and collect Sales Tax on Services. KPRA is governed, with relative autonomy, has been placed under the Excise and Taxation Department to have an interface with the Government. While, the Council acts as Policy Making body chaired by the Honourable Chief Minister, Khyber Pakhtunkhwa, and comprising of three (03) Cabinet Ministers for Finance, Law and Excise and Taxation, Chief Secretary, Secretaries of the Finance, Law, Excise, Taxation and Narcotics Control departments. KPRA invites application from eligible candidates having domicile of KPK to fill the vacant post in its headquaters and Regional offices in D.I Khan and Abbottabad. All those candidates who are eligible for the KPRA BPS 12 BPS 16 Jobs must apply to avail this golden opportunity. 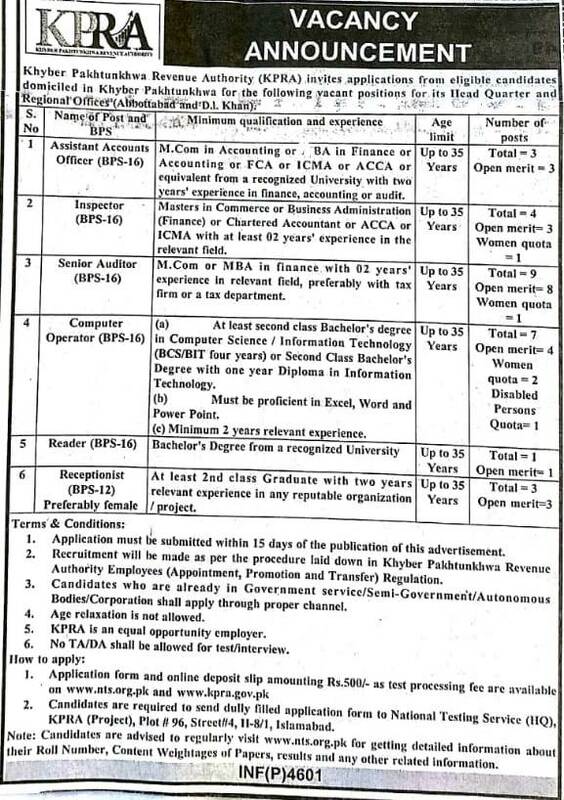 Applying procedure as well as other requirements for Khyber Pakhtunkhwa Revenue Authority KPRA BPS 12 BPS 16 Jobs Via NTS are mention below. NTS test fee which is Rs 550/- can be pay in any branch of HBL, UBL, MCB, or ABL. Candidates who are already in Government Service / Seni Government Service apply through proper channel. Last date to apply is Monday, 17th December 2018.